There is more than meets the eye with the Hawaiian Islands of the Pacific Ocean. The islands presently sit above a so-called mantle plume, or a conduit of anomalously hot rock upwelling from thousands of kilometers deep in the Earth's interior. This hot feature explains why the islands are dotted with active volcanoes. But the Hawaiian Islands also reside on the Pacific tectonic plate, which is moving across the top of the mantle plume—at the blistering pace of a few cm/year—which means that in a few million years the islands will have moved off the hot conduit and volcanism in the Hawaiian Islands will cease. As Hawaii's active volcanoes die in the future, new volcanic islands will appear elsewhere on the Pacific Plate, specifically at spots that replace the Hawaiian Islands above the hot conduit. This process is much like what would happen if you moved a sheet of paper over a stationary candle: the movement of the paper will be recorded as a trail of burn marks from the heat of the candle beneath. Hawaii is presently over the "candle," but in the future it will have moved away from it and the candle will begin singing a new spot on the paper. This process has happened over and over again in Earth's long history, and Hawaii is just the latest volcanic chapter in a story that extends backward at least 80 million years. The Hawaiian Islands lie at the end of a chain of now-extinct volcanoes and seamounts (submerged volcanoes) that stretch ~6,000 km northwest across the floor of the Pacific Plate, to the junction between the western Aleutian Islands and the Peninsula of Kamchatka. Returning to our paper and candle analogy—this chain is the same as the path of singed marks leading backwards from the present location of the candle beneath the paper. 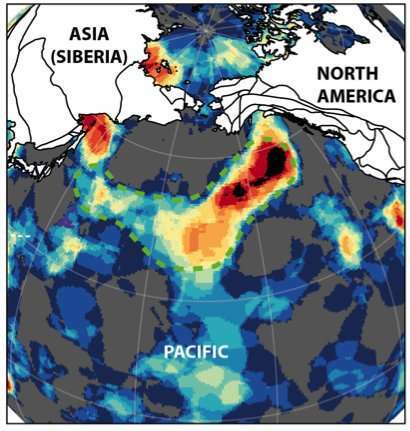 In the Pacific, the volcanoes and seamounts that constitute this chain grow progressively older to the northwest, as would be expected if the chain marked the slow and progressive drift of the Pacific Plate above a mantle plume. But something curious catches the eye about this submerged volcanic chain in the Pacific: it isn't straight. 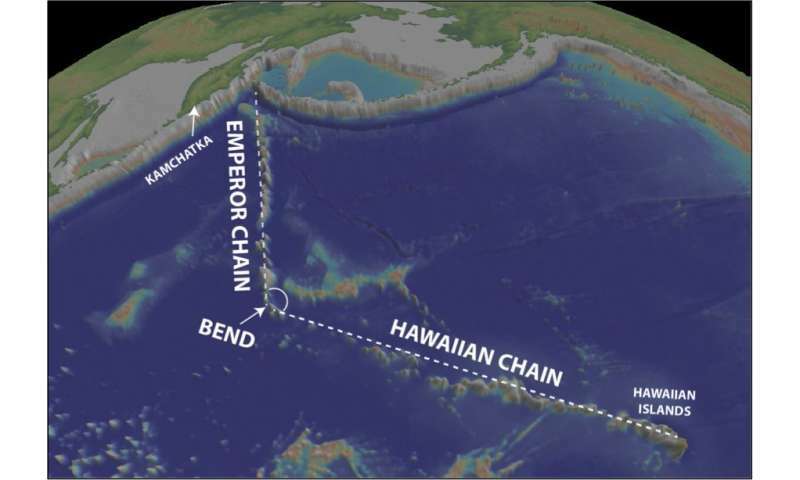 A very conspicuous kink divides the chain into two segments: a mostly west-trending segment (the "Hawaiian Chain') and a mostly north-trending segment (the "Emperor Chain'); the kink between is thus commonly referred to as the "Hawaiian-Emperor Bend." Volcanic rocks sampled from seamounts on either side of the bend have been dated, and indicate that the bend developed approximately 47 million years ago. So what caused it? This very question has been the source of debate and controversy among researchers for half a century. The classical explanation is that the bend marked a swift and substantial change in the direction of motion of the Pacific Plate about 50 million years ago, but supporters of this interpretation have struggled to explain why that sudden change occurred. Magnetic rocks: Magnetic information preserved in the island arc rocks (acquired from the Earth's magnetic field when the rocks originally formed) can be used to determine the latitude at which they originated—and the magnetic information from the island arc rocks reveals that they came from further south than where they are located today (this also corroborates their exotic nature). Deep rocks: Island arcs only develop along a subduction zone, so the formation of the island arc should have been accompanied by subduction, and subduction, in turn, is associated with the sinking of oceanic tectonic plates into Earth's interior. The relics of subducted oceanic plates can be "imaged" by seismic waves generated by earthquakes, in much the same way that your bones can be imaged with X-rays during a CT scan. By such seismic imaging techniques we have identified the relics of a subduction system that was formerly located at the northern end of the Pacific Plate, at the same place that the island arc rocks were located according to their magnetic data. Siletzia's origin along an oceanic spreading center: What's Bremerton got to do with it?